A quick trip around the blogosphere via Pinterest reveals some pretty interesting food trends. One of which was waffle pizza. I decided to give it a whirl to see if hubba would count it as Man Food. Make a rollable pizza dough- for this experiment, I used a Chebe mix, a rare treat for us. Add one cup of cheese into the dough if you’d like. Roll the dough very thin and into a two squares, just wide enough to fit your waffle maker. Preheat your waffle maker and set it onto the darkest setting. Get out pizza sauce and your preferred toppings. 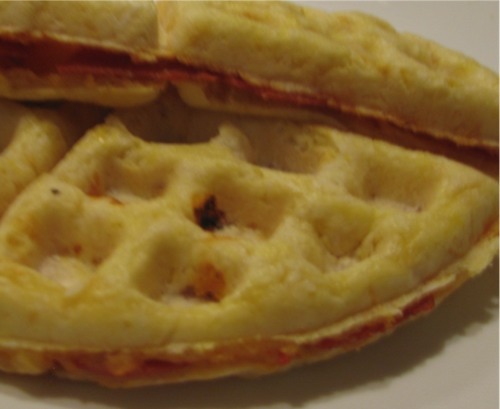 Place one of the dough squares onto your waffle maker, smooth on the sauce into the waffle portion of the maker. You don’t want to go out of the waffle area with the sauce or the toppings. Add the toppings you want then top with the second square of dough. Press the waffle maker closed and cut off the excess dough from around the sides. Hold down the handle and allow it to cook until done. Pull out and trim off the excess. The waffle maker seals the edges and cooks the dough into being puffy. Serve it and watch hubba and the kids smile. 😉 They all loved it as a special treat. Neat idea! We’ve made pizzas from English Muffins and the kids love them. KA, I have a Belgian waffle iron. Will that work for this or is it too deep? Kelly, I’d say give it a whirl. As long as the dough is thin, it should work.